Knowing that we fell within a good band to view a partial portion of the annular eclipse, Paul and I scoped out the local county roads earlier in the day for optimal horizons. 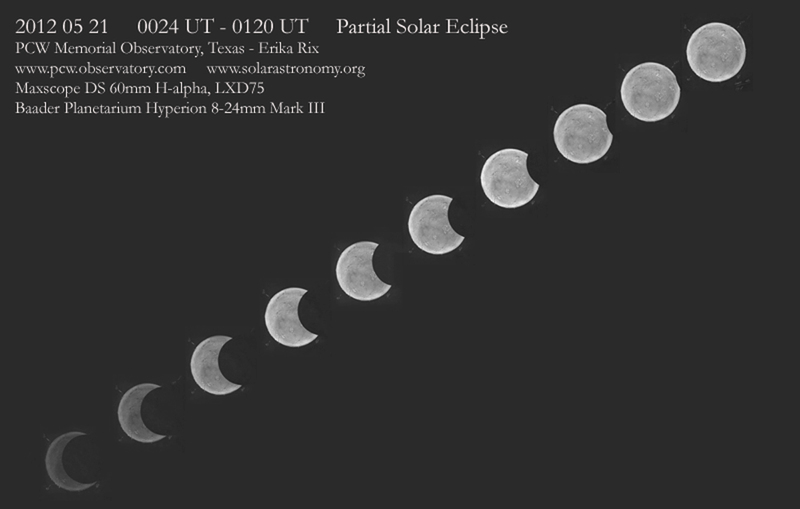 The partial eclipse for our location was due to start at 1932 ST (0032 UT) which would only give about 50 minutes of eclipse viewing before sunset. The skies cleared up and we were fortunate to have perfect viewing conditions that evening. 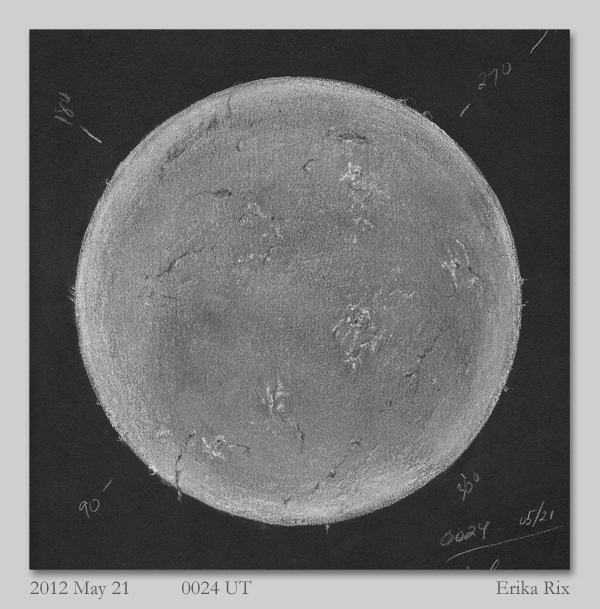 I started off drawing the full solar disk in h-alpha. 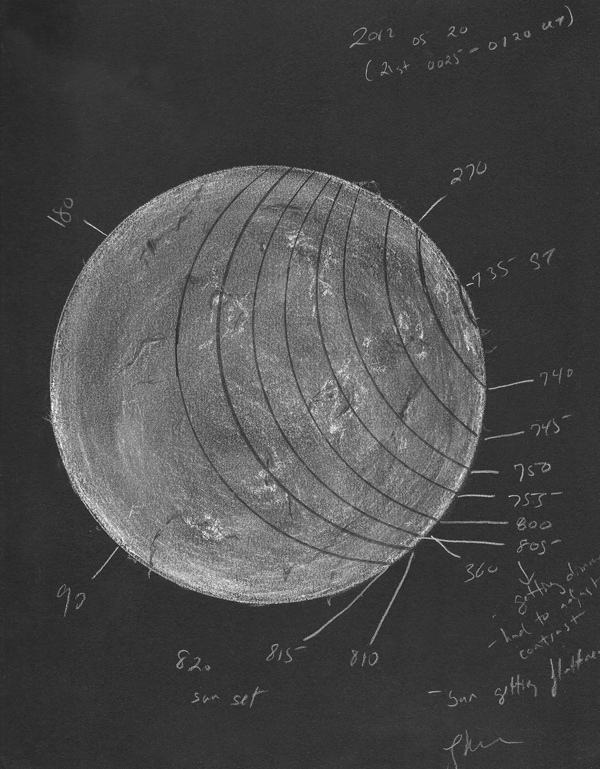 Four active regions lined up east to west with two more to the south (depicted to the top of the first sketch in the animation). I then made a quick second sketch to use for recording the times and placements of the Moon as it passed between Earth and the Sun. First contact was at 0032 UT. The first marking was at 0035 UT. I set my iPhone’s timer to go off every five minutes until sunset, marking the Moon’s progress each increment with my oil pencil along with the times. In between, Paul and I would alternate using a pair of solar glasses from solarastronomy.org and the views from my double-stacked Coronado Maxscope 60mm h-alpha telescope. The first image of the animation shows the original sketch in its entirety. Later, I used the second solar disk sketch as a reference to recreate the eclipse on the original sketch with a cut out circular piece of black Strathmore paper. This animation is the result. As the solar disk became too dim to view (represented in the last couple frames of the animation), I was forced to leave the eyepiece and enjoy the last several minutes with the solar glasses and my camera. Two original sketches created at the eyepiece with black Strathmore Artagain paper, white Conte’ crayon and pencil, white Prang color pencil, Derwent charcoal pencil, black oil pencil. Wonderful. Especially like the great animation !! !